Japanese Episode BW 037: "The Fishing Sommelier Dent Enters!!" American Episode 1437: "A Fishing Connoisseur in a Fishy Competition!" On their way to Raimon City, Satoshi and his friends bump into their old friend Bel. She tells them about a fishing competition taking place in town and explains that the contestant who catches the largest water-type pokemon will win a special deluxe fishing rod. At that moment, Dent reveals that he's a Fishing Sommelier and claims that he'll be the one to grab the prize! Unknown to our heroes, however, is that the fishing competition is really just another one of the Rocket-Dan's schemes to steal pokemon! After our heroes unwittingly enter, Dent shows off his skills by easily plucking a Basslhau out of the water. Later, Bel's line catches a rowdy Pururill! The pokemon's attack draws a crowd around Satoshi and his friends, giving the Rocket trio the perfect opportunity to make a run for it with the pokemon that had already been turned in. However, their plans are foiled when that very same Pururill tips over their escape boat! It then starts to release all the stolen pokemon from their Monster Balls, clueing the other contestants in on the fact that the whole thing was a scam! The Rocket-Dan remove their disguises and try to fight the trainers off, but Satoshi's Pikachu and Dent's Yanapp make quick work of their Koromori and Deathmas. Musashi and the others don a pair of rockets and retreat, leaving all the stolen pokemon behind. Later, Bel learns that Satoshi is heading toward Raimon City. After she parts ways with our heroes, Satoshi-tachi continue their journey toward Satoshi's next Gym challenge. This is the unfortunate case of the behind the scenes stuff of an episode overshadowing the actual episode itself. BW 037 is famous for being the one that was retconned to occur between the Archaeos episode and the Zorroa episode. I don't want that whole thing to take over this comparison, so I created a page called Japanese Episode BW 037 - The Post 3/11 Edits to cover that aspect of the episode. So like I said, it's unfortunate that the behind-the-scenes stuff completely overshadows the rest of the episode because this is actually one of the better entries in the series. Bel makes another great appearance and brings some great comedy to the episode, Dent is entertaining as hell, the Rocket trio actually has something resembling a personality (!! ), the battle between Dent and Basslhau is entertaining, Satoshi makes a reference to the past (the whole "I've been fishing before" line), and Iris manages to be entertaining when she tries to pick out a Basslhau with her bare hands. Sure, it's ultimately a useless filler, but it's a fun useless filler. Unfortunately, it seems like the writers didn't seem to know how to handle the actual fishing tournament itself. The set-up is fine and all, but the whole middle of the episode just sort of listlessly goes from random non sequitur to random non sequitur. Maybe it's the fact that we don't really see any of the other contestants as a threat that I have a problem with? Or perhaps it's the tournament's ill-defined rules are the issue? While I did enjoy all the individual vignettes on their own, they didn't really add up to a cohesive plot on the whole. The Rocket-Dan's scheme in this episode also doesn't make a whole lot of sense to me. Their whole scheme seems to be to buy all these Monster Balls and fishing rods and then trick other trainers into using said Balls and rods to catch pokemon that they're too lazy to bother fishing out themselves. Am I missing something here? The trio usually goes for pokemon that trainers have had for a while since they tend to be stronger and more battle hardened, but this scheme of theirs would basically just net them a bunch of freshly caught amateurs. Since Team Rocket is back to being in-character, TPCI has gone back to dubbing them the way they did back in Diamond & Pearl somewhat. It's not as bad as it was in, say, Sinnoh League Victors, but the trio's dialogue does go back to being more of a general summary of their Japanese dialogue rather than a straight-up translation. Other than that, all the lines referencing alcohol got rewritten, but I doubt that's really much of a surprise to anyone. Ash: "Oh yeah! We're gonna battle soon!" Originally, Satoshi wonders what kind of Gym the Raimon City Gym is. Later, Satoshi and his friends register for the competition. The special Monster Balls they're given for the competition are called Fishing Balls (フィッシングボール), but the dub changes the name of these items to "Fishing PokéBalls." I guess they were afraid the original name was too innuendo-y? Bianca: "That must be where we're fishing. Wow! Look at all the competitors!" 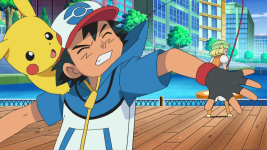 Ash: "I get it! Once you reel one in, you battle it over there!" The dub makes it sound like Ash is only just now figuring out the rules of the tournament. In the Japanese version, however, he already knows the rules and is just repeating them to himself. Cilan: "And with a single stroke, your water-type Pokémon battle has begun." Cilan: "Once your line is in the water, you wind the reel slowly to catch their attention. Think of it as aging a fine cheese. Perfect! Savor it!" The alcohol edits begin! Cilan's "Think of it as aging a fine cheese" replaces Dent's "Think of it as maturing over time" (あたかも　時とともに熟成していくのを楽しむようにね). The word I translated as "maturing," jukusei (熟成), is primarily used when talking about wine. Cilan: "After it's been hooked, you gently lure it to you as you raise your rod, like removing a soufflé from the oven." Here, Dent tells the others to raise the rod as if you're gently pulling the cork from a vintage wine bottle (ビンテージもののコルクを静かに抜くように). Though I will admit that for an awkward alcohol cover-up, the line TPCI came up with this time is actually pretty clever. After pulling Basculin into the pool area, he begins to admire his latest catch. Cilan: "You're quite a prize. Now it's...Catching Time! Pansage, you're up!" Amazingly, Dent doesn't say "It's Catching Time" in the Japanese version like you'd expect. He simply says that he'll catch the Basslhau without using his catchphrase. Weird! Cilan: "A remarkable Basculin! And it's all mine!" Cilan: "Now I'll allow you to mature in my Fishing PokéBall, letting your many talents ripen into full bloom"
Alcohol edit number three involves Dent telling his newly caught Basslhau that he'll let it decanter in its Fishing Ball. The script for the second half of the episode is pretty well translated! There are a few instances of the dub's dialogue being worded a little strangely (Bianca's "rocket scientist" lines come to mind), and then there's the thing the dub always does where they have Team Rocket refuse to use Giovanni's name for whatever reason. But just about everything else is faithful to the original.